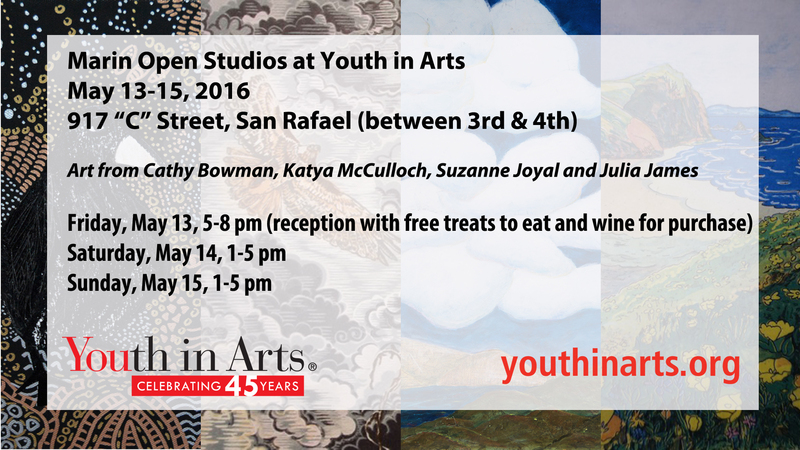 Come enjoy work from Mentor Artists Suzanne Joyal, Julia James, Cathy Bowman and Katya McCullough at Youth in Arts during Marin Open Studios. All four of these talented women teach art to children and teens throughout the Bay Area, and now you have a chance to see (and take home!) their professional work. Our current YIA Gallery exhibit “Imagining Friendship: Art From the Walker Rezaian Creative HeArts Program” will also be open, featuring work from Suzanne’s kindergarten students at Laurel Dell Elementary in a “climb through” interactive recycled art environment. Fun for kids while you shop for art!